With drought in the headlines in California, this seems like a good time to look at trees and shrubs that will thrive in hotter, drier areas of the country. If you garden in California, Nevada or Arizona you do have the ability to grow a lot of exotic plants that will not survive in colder regions, but as the present conditions show, hot areas can be just as difficult for plants in their own way, especially if water is in short supply. So let’s take a look at plants that grow well in Zones 7, 8, 9 and 10 and which are hardy down to 00 Fahrenheit but no colder. As well, it is important in this time of water-consciousness, that these plants should be able to survive drought with little or no extra water. Of course all newly-planted trees need some watering to establish, so for the first year or two regular watering will be necessary before they become fully drought-tolerant. Speaking of water, don’t neglect your supply of ‘gray’ water, from showers and washing machines particularly. If you can divert that water into the garden instead of down the sewers it will help your plants without impacting on water consumption – a great solution to a difficult problem. In hot areas shade is a definite priority, so that you can enjoy that long summer weather in your garden. Deciduous trees are a good idea, since they will allow the winter sun to shine into your garden, making it more usable all year round. A great choice is the Autumn Purple Ash (Fraxinus americana ‘Autumn Purple’) which unlike its wild form turns rich fall colors instead of just yellow. This is a reliable, hardy tree that will survive drought and heat happily once established, while giving cool shade to your garden. This is a large tree, so allow enough room when planting. Unlike other ash trees you may have met, the Autumn Purple Ash does not produce any seeds, so it cannot spread or become a weedy nuisance. Once established it will tolerate heat and drought well, with perhaps the occasional deep watering to help it along. For a lighter shade, the Thornless Honeylocust (Gleditsia triacanthos f. inermis) is a great choice, which again does not produce the seeds wild, thorny versions will. With its spreading crown, this tree will soon provide a light, airy look and grace any garden with its golden leaves in the fall. It is very drought-resistant, but also tolerant of moist soil too, in fact it is very adaptable to all kinds of soils and conditions. This is a perfect tree for trouble-free gardening that will just take care of itself. 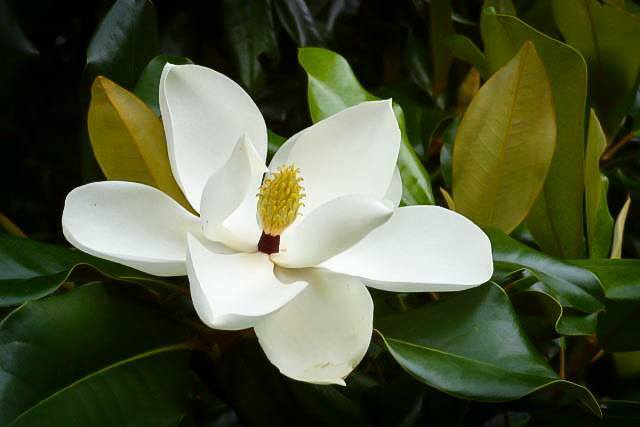 For year-round shade, and flowers too, consider the Southern Magnolia, which is available in improved forms such as the Southern Magnolia “Edith Bogue” or the Southern Magnolia “Blanchard”. These forms of the native Magnolia grandiflora thrive in hot areas – either the humid ones of the south-east, or warm states with dry summers in the south-west. They benefit from some additional water in their early years, but once established they will be smothered in summer with their huge, white, twelve-inch flowers flooding your garden with heavenly perfume. The foliage is always healthy and a glossy, rich deep-green color all year round. Many evergreen trees are very drought resistant, and for a beautiful, dramatic tree that will cast shade as well as be a good screen or specimen, consider the Blue Atlas Cedar (Cedrus atlantica). This tree originates in North Africa and the Middle East, so sun and drought are its natural companions. It will grow to around 50 feet in height, developing graceful, spreading branches and a wonderful form as it matures. The blue needles cluster on the branches and make for an eye-catching tree you will be proud to have in your garden. 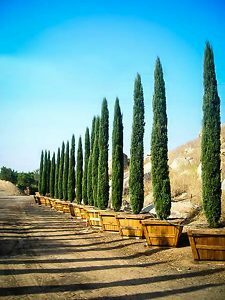 Another dramatic tree from the Mediterranean is the Italian Cypress (Cupressus sempervirens), which forms a narrow column up to 40 feet tall and stays naturally dense and narrow without any clipping, although it can also be clipped for an even tighter profile. Its dark-green outline is seen throughout sunny Italy and in hot areas of America it will thrive with no problems at all. In limited space it can be planted closely together to make a screen or hedge for a narrow space, giving privacy, beauty and drought-resistance all in one fast-growing package. 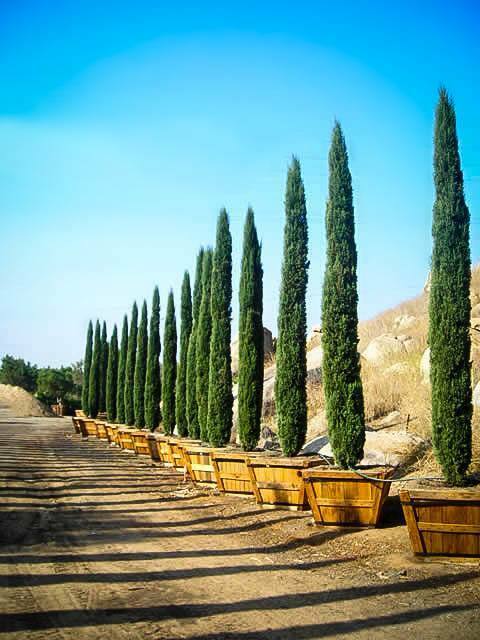 For other screening hedges or barriers in hot, dry conditions, the Junipers have a lot to offer. Top of the list is the Spartan Juniper, a dense, rich-green tree that is perfect for hedges, screens or specimens and even does well in a large pot or planter box. Left unclipped it makes a looser but still dense screen and clipped it will be solid from top to bottom and look beautiful too. The Spartan Juniper is a selected form of the Chinese Juniper and another exotic form of that tree which is especially suitable for hot regions as a specimen is the Hollywood Juniper, which is an extraordinary tree with angular branches and foliage that is crusted on the stems so it resembles coral. Left unclipped it will make a dramatic, irregular specimen perfect for a modern garden, or it can be clipped into pom-poms or spirals as striking decoration for any garden. It is extremely drought-resistant and thrives in hot, dry locations. Gardens are not all green and flowers have a big part to play too. If those flowers come on a hardy tree, that will thrive in the heat and drought, then all the better. First choice would certainly be the Crape Myrtles, which are well-known for their ability to bloom and thrive in hot, dry spots in almost any soil. Although the recent trend has been towards breeding dwarf forms, there are still plenty of large-sized Crape Myrtle trees especially suitable for smaller gardens, since they are large enough to give some shade and make a real flowering statement all summer long, without overwhelming the space. 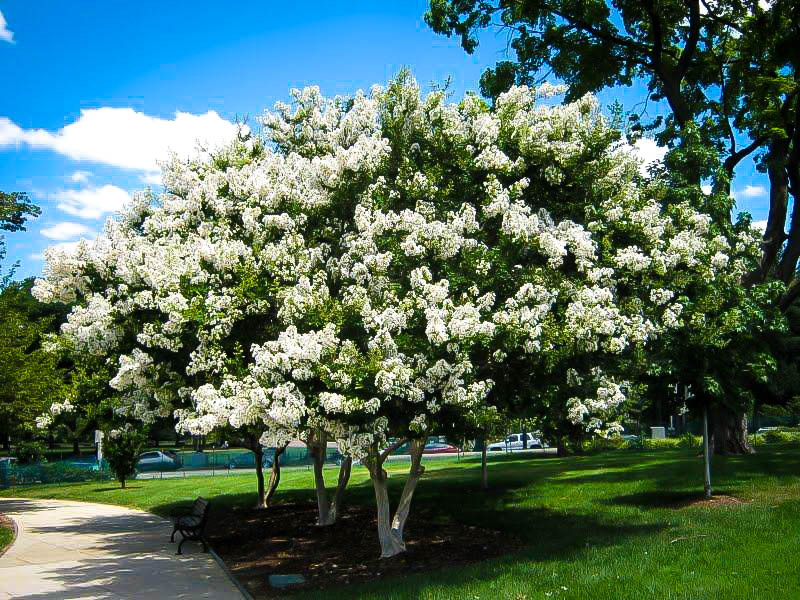 The Natchez Crape Myrtle reaches 20 to 30 feet and its pure-white blooms give a cool look in any garden. The Muskogee Crape Myrtle is similar, but in a charming lilac color. The Dynamite Crape Myrtle in cherry-red or the Sioux Crape Myrtle in pink are smaller, but both can reach 20 feet, big enough to make a strong impression but stay manageable. 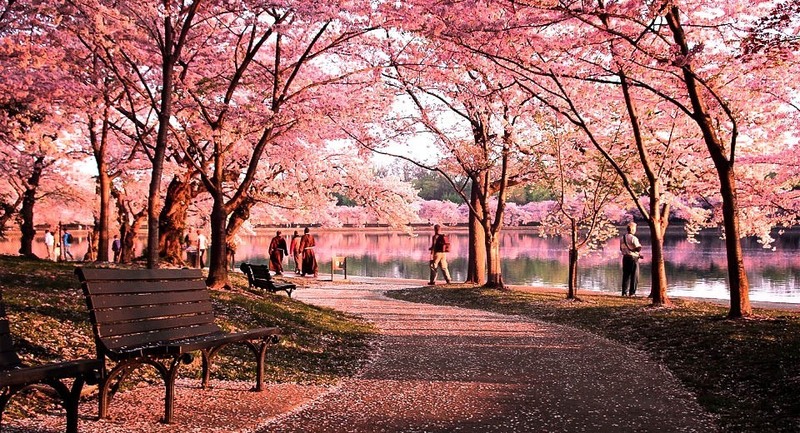 Cherry blossom trees, often associated with the north-west, also thrive in warmer areas, at least throughout zone 9, and have fewer disease problems in dry regions. The Okame Cherry Blossom Tree is smothered in pink beauty in late winter. It will grow to a wide-spreading 20 feet tall, small enough for a smaller garden and also to allow you to plant several in a bigger yard. 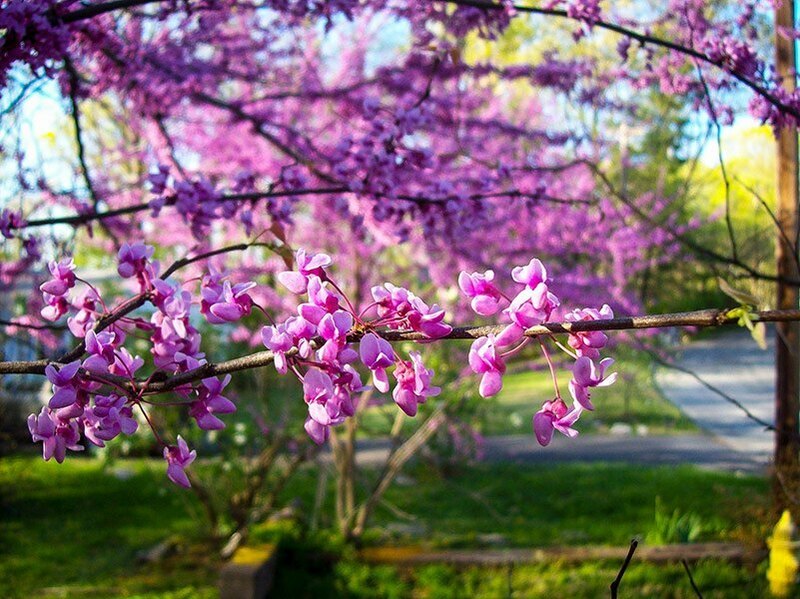 The Western Redbud (Cercis occidentalis ) is a stunning and often overlooked choice for a small flowering tree. 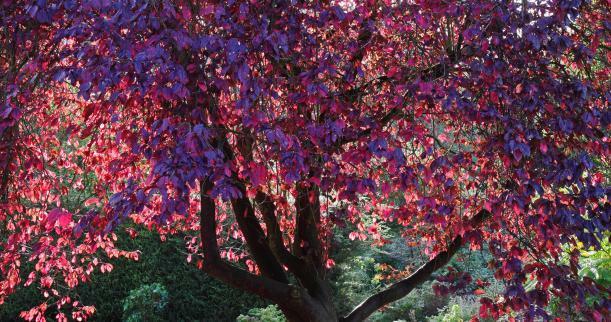 Unlike its eastern cousin this tree is drought and heat tolerant to an amazing degree and its purple blossoms along the bare branches in late winter or early spring make a knockout showing. The heart-shaped leaves are beautiful too and the whole thing is topped off with rich fall colors, even in warm areas. This is a plant not to be missed. It will reach 15 feet or more and can be pruned into a tree with two or three stems or grown as a large bush, as you choose. Remember that with water in short supply it is better to let a hose trickle directly into the ground rather than turn on a sprinkler. A lot of water will simply evaporate if you throw it into the air. Mulches are great for conserving moisture by reducing surface evaporation, but when soaking a tree put the hose in contact with the soil, not just on the mulch, as a wet mulch doesn’t do much for keeping the roots moist – a dry one is a better insulator. This is just a sample of suitable trees for hotter and drier states that we have available at the Tree Center. Browse our site or ask us a question – we are always happy to help with your choices.